32 orangutans were reintroduced to the Bornean rainforest between January 2018 and July 2018. This brings the total number of released orangutans to 358 since 2012, when BOS Foundation launched their new and improved programme of reintroducing orangutans to the wild with the help from Save the Orangutan and other partners. The release of rehabilitated orangutans begins with a long and challenging journey by roads, rivers, and sometimes even helicopter trips to the selected release site best fit for the orangutans. Months of planning – all worth it in the end! Releasing rehabilitated orangutans is both a challenging and resource-intensive effort. The joy of successfully reintroducing rehabilitated orangutans to the wild is therefore unspeakable. Every release is the result of months of planning, and it often includes a long journey deep into the rain forest to carefully selected release sites promising the best chances for the survival of the individual orangutans. Prior to this, the orangutans have gone through years of training at the rehabilitation centres. At the centres, they acquire the skills necessary to survive in the wild. 32 orphaned orangutans have ventured on their last journey in the rehabilitation programme, the journey to their release sites, this year alone, and more releases have been scheduled for the rest of the year. BOS Foundation, our Indonesian partner responsible for the releases, has reintroduced a total of 32 orangutans to three approved forest areas on Borneo in the first half of 2018 with the help from local authorities in Central and East Kalimantan. Of these 32 orangutans, 21 came from the Nyaru Menteng rehabilitation centre and 11 came from the Samboja Lestari rehabilitation centre. A total of 358 rehabilitated orangutans have been successfully reintroduced to the Bornean rainforest since 2012. The transportation cages are opened, and the orangutans quickly climb up the trees. They now have to adapt to their new home. Fortunately, the adaptation success rate is very high. Where are the rehabilitated orangutans released? BOS Foundation releases orangutans from the Nyaru Menteng centre, Central Kalimantan, into the national parks Bukit Baka Bukit Raya (TNBBBR) and Bukit Batikap, and the orangutans from the Samboja Lestari centre, East Kalimantan, are released into the Kehje Sewen area. The forest areas are geographically scattered, but all of them have been approved as release sites. Furthermore, the three large forest areas used as release sites are protected by locals patrolling the areas to prevent and stop illegal activities. 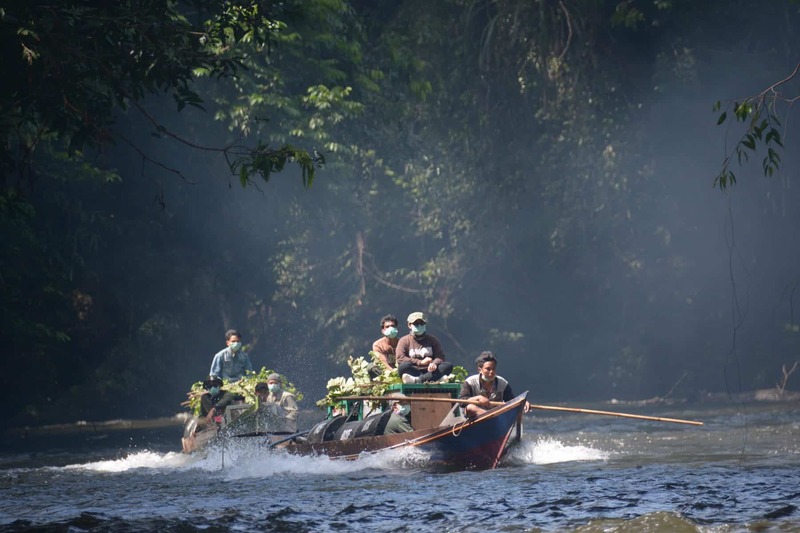 In each area, at least one camp for the locals monitoring the released orangutans and patrolling the area to prevent or stop illegal activities, have been set op. They report their observations to the head quarter on a regular basis, and they intervene if an orangutan does not thrive or needs help. They also report illegal activities, such as logging and poaching, to the authorities. The view of Kehje Sewen, one of the unique rain forest areas used as a release site. Bukit Baka Bukit Raya National Park (TNBBBR) is the newest of BOS Foundation’s three release sites. The national park is in Central Kalimantan about 10 hours away from Nyaru Menteng, and it covers 236,000 hectares. The area is protected since it is a national park. A primitive camp, Lewun Kahio, has been set up in the area. From here, 13 local employees can go monitoring and patrolling while a new and more permanent camp is being constructed. BOS Foundation has access rights to 27,472 hectares of the national park, and they use this right to release rehabilitated orangutans. TNBBBR’s caring capacity is an estimate of 200 rehabilitated orangutans. So far, 92 rehabilitated orangutans have been released here. Bukit Batikap National Park is in Central Kalimantan, covering 350,000 hectares. The area is a protected forest area, and reaching it requires several days of travel. Consequently, the releases in this area are often carried out by helicopter. BOS Foundation has access rights to over 35,000 hectares of the national park, and they use this right to release rehabilitated orangutans. 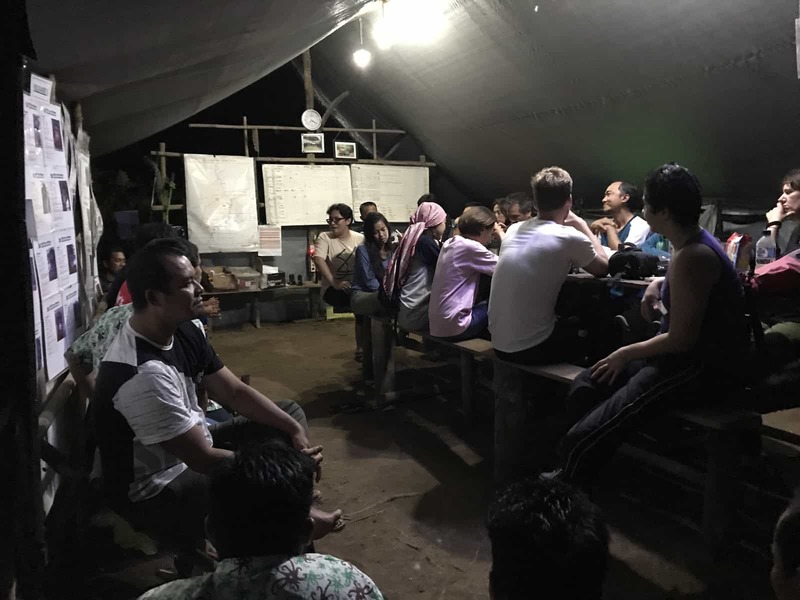 The Tutat Jalo camp has been set up as the base of a monitoring team of 9 people. So far, 175 rehabilitated orangutans have been released into the Bukit Batikap area, which is close to the caring capacity of the area. Kehje Sewen Forest is in East Kalimantan and it covers 86,450 hectares. The area is a nature rehabilitation area managed by BOS RHO. Two camps, Camp Lesik and Camp Nles Mamse, have been set up and another camp, Camp Kelinjau, is under construction. So far, 91 rehabilitated orangutans have been released into this area. The map indicates the location of the different release sites. Green: Bukit Batikap, purple: Bukit Raya (TNBBBR), and pink: Kehje Sewen. BOS Foundation is working on obtaining access rights to the yellow area. Additional release sites are necessary to release the current approx. 600 orangutans at the rehabilitation centres. BOS Foundation is therefore persistently working to obtain access rights to other forest areas that may potentially be redistributed to be used for plantation or mining. Among other things, BOS Foundation are working to obtain access rights to two additional areas in close proximity to Kehje Sewen. A picture from a visit to the camp in TNBBBR. When the team returns from their monitoring, a briefing about the trip and their observations is presented. How are the released orangutans doing? Our work for the individual orangutans does not end with their release. The released orangutans and their adaptation to their lives in the wild rainforest is monitored closely, and the release sites are patrolled regularly to ensure that no illegal activities threaten the released orangutans. Monitoring teams from the camps at the release sites monitor the orangutans closely during the first 24 hours of their release to ensure they find enough food and nest at night. In the following months, the orangutans’ movements are observed and behavioural data is gathered and analysed with the aim of evaluating the individual orangutans’ adaptation to their new lives in the rainforest. The releases of more than 350 rehabilitated orangutans reveal that they do just as well in the rainforest as the wild orangutans. Moreover, orangutan births among the released orangutans (7 in Batikap and 3 in Kehje Sewen) suggest it is possible to establish new sustainable populations of wild orangutans at the release sites. We are learning a lot despite the fact that the new reintroduction programme only came into effect in 2012. We are looking forward to following the development in the wild rainforest closer in the following years. 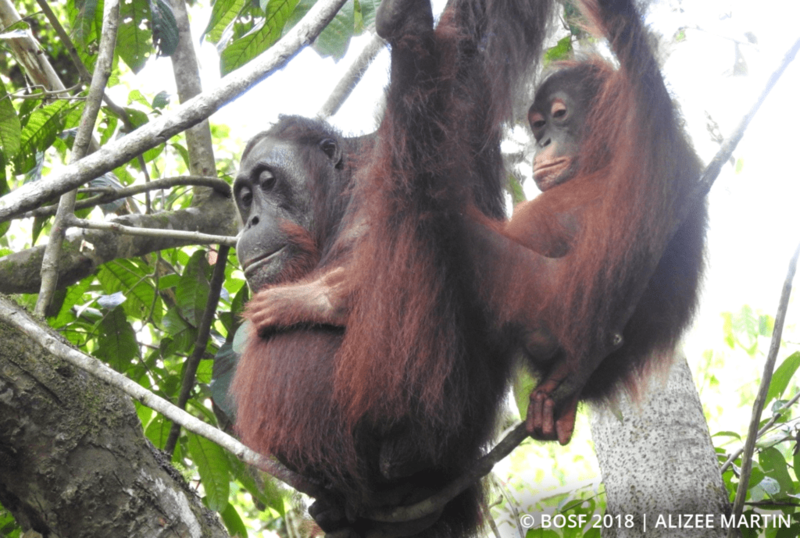 This photo is from the monitoring of a mother and her baby in Bukit Batikap in 2018. We will focus more on the work at the release sites and will follow the release of several rehabilitated orangutans. Additionally, Save the Orangutan and BOS Foundation explore the possibilities of improving the post-release monitoring and the patrolling of the release sites. We hope to give you a better insight into the released orangutans’ lives in the rainforest through the installment of ‘camera traps’ and the use of new drone technology. We are looking forward to sharing more developments with you. Reintroducing orangutans to the wild is still innovative pioneering work.